The fires were extinguished 50 years ago, but in many ways, the intersection of 12th Street and Clairmount in Detroit remains scorched earth. The racial injustice, segregation and tension that ignited one of the nation’s ugliest social rebellions continue to smolder. And people still have a hard time honestly talking about it. Bridge and its reporting partners at the Detroit Journalism Cooperative announce the release of “The Intersection,” a book based on a yearlong investigation into the social and economic conditions in Detroit that led to the violence that erupted on July 23, 1967, leaving 43 dead, thousands arrested or injured, and neighborhoods in flames. The book provocatively asks whether those same, desperate conditions still endure today. David Zeman, senior editor at Bridge, notes that Detroit has certainly seen social progress, perhaps most notably in the racial composition of the city’s police force. But the book shows that many of the factors that led to the rage of 1967 ‒ poverty, unemployment, education, and incarceration rates ‒ are actually worse today for African-American Detroiters. “The Intersection” is organized around the major findings of the National Advisory Commission on Civil Disorders, known as the Kerner Commission, which President Lyndon Johnson appointed to examine the racial impetus for riots that shook the country that year. “The Intersection” uses powerful narratives, data analysis and recent polling to conclude that, while Detroit’s downtown and Midtown areas are enjoying an economic resurgence, neighborhoods surrounding the looted intersection and across many parts of the city are suffering even more now. Published by Mission Point Press in Traverse City, the book is based on reporting over much of 2016 by the nonprofit Detroit Journalism Cooperative, which includes Bridge, Detroit Public Television, WDET Detroit Public Radio, Michigan Radio, and five ethnic publications of New Michigan Media: The Arab American News, Latino Press, The Jewish News, MI Asian and The Michigan Chronicle (A sixth partner, Chalkbeat Detroit, joined the DJC this year). The cooperative is funded by the John S. and James L. Knight Foundation, The Ford Foundation and the Corporation for Public Broadcasting. “The Intersection” is bookended by separate pieces by Bridge reporter and Detroit history expert Bill McGraw. He begins with a tally of what some call a riot and others describe as a rebellion: in addition to the dead, the violence destroyed 690 buildings and left at least 388 displaced families. It ends with McGraw’s haunting narrative about how the scars of those awful days still plague the family of Walter Scott III, the man who reportedly threw the first bottle during a police raid of an after-hours bar and gambling den, which helped spark the carnage. 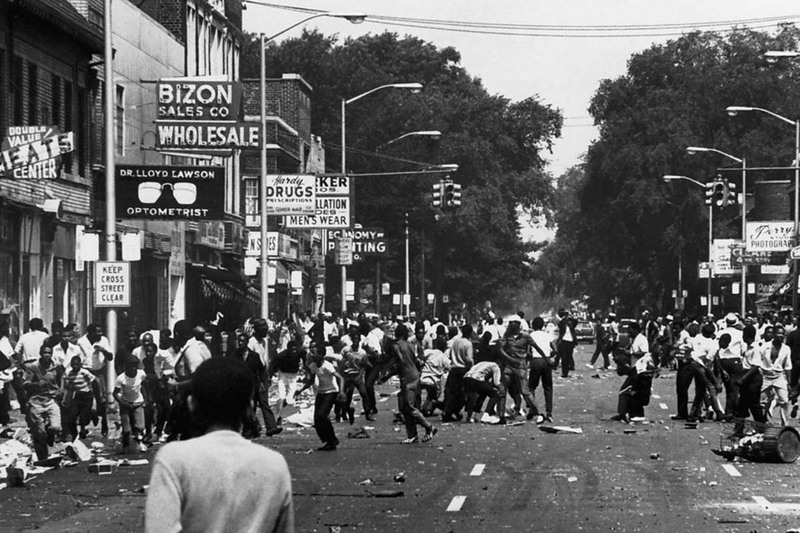 RELATED: Phil Power: "1967 uprising feels like yesterday..."
Over eight chapters, some of Detroit’s most accomplished journalists explore the region’s racial divisions, including a poll that shows whites and blacks in the region still are far apart when it comes to views on police and groups such as Black Lives Matter. Most blacks said race affects their daily lives, but the same was not true for whites. “This tells us we all have work to do. We have not talked about racial issues because it's uncomfortable (especially for white people),” said Lester Graham, a reporter for Michigan Radio and Friday host of its Stateside show. The Kerner Commission concluded the United States was “moving toward two societies, one black, one white ‒ separate and unequal.” It made numerous recommendations for reducing racial inequities, but the report was shelved, its policy recommendations never implemented. In Detroit, it’s jarring to find so little progress since then, said Sandra Svoboda, special assignments manager for WDET, whose findings helped shape the project. “We were reporting these stories with this particular historical context at a time of unprecedented national conversation about race ‒ Obama's presidency, the emergence of the Black Lives Matter movement, Detroit's struggle with its so-called old and new identities, for example,” Svoboda said. Stephen Henderson, the host of WDET’s “Detroit Today,” wrote in the book’s foreword about 12th Street and Clairmount, the west side crossing where the violence started. See interviews with Detroit Journalism Cooperative reporters on a special episode of American Black Journal that airs Wednesday at 7:30 p.m. on Detroit Public Television. Watch a preview of the segment HERE. I was 16 at Redford High School. I look forward to the read.